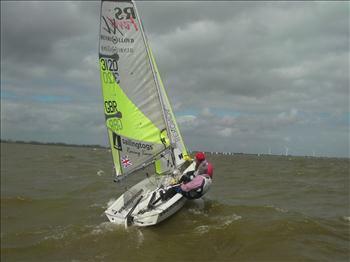 The RS Feva National Squad were in Medemblik Holland for the United 4 Regatta. They had two days training with Coach, Dave Hivey and then the Regatta at the weekend. The squad stayed together in bungalows surrounded by rivers. The first day of training started with sunshine and no wind, the Fevas did not join the Oppi driftathon until the wind picked up at little after lunch. 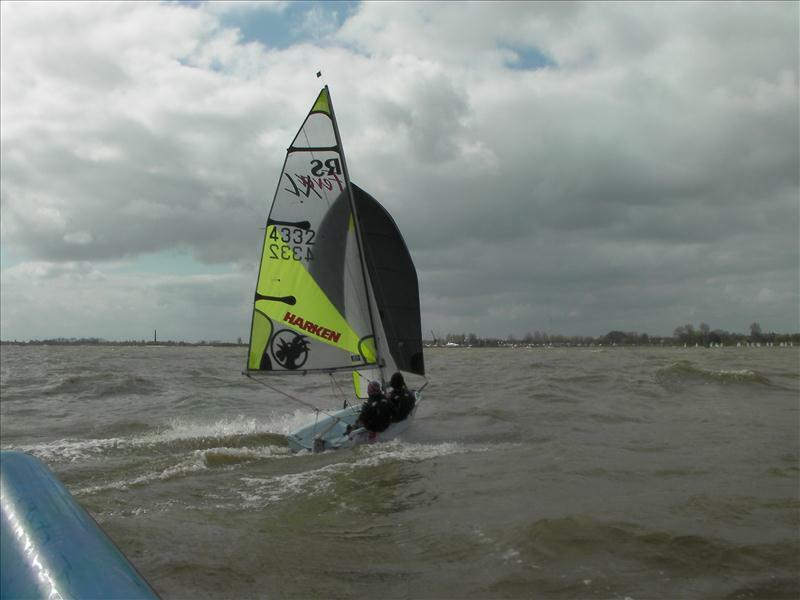 They got in some useful light wind training on boat speed and cloud awareness ( Medemblik is a huge cloud venue) The weather then mirrored the weather back in Britain to produce thunder and hail. That night the team all got together with the house parents for a Spag boll, bungalow party. The team going off for a swim in the pool later to get rid of all that energy. Thursday morning started with a light breeze, so they went over their boats with the coach and made sure boat preparation was in top condition, updating outhalls and adding more tell tails on the sails. After lunch the windmills started turning so the squad set out. They were encouraged to use the new tell tales as much as possible to help get the optimum setting for the sails. At 3pm they started hiking as the north wind filled in. There were a few premature starts so went to the black flag. The Oppi fleet out training, 50 strong got confused and thought our finish line was their windward mark so there was a little congestion as the two fleets collided! The final race was hilarious, with the rules of standing only, with the crew and helm both having to cross the boat by running around the front of the mast. 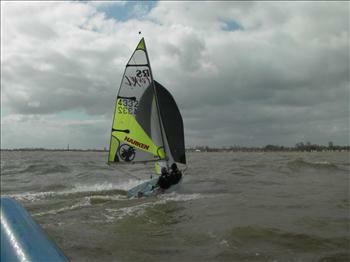 The downwind leg had to be sailed backwards, showing useful skills for holding on a start line. This was won convincingly by Anna and Jess, with Elliott and Jake second. Racing on Saturday – Jenny Smallwood/Jamie Webb won 1st race from Dutch sailors Daan Dutilh and Roos van Lookerenoat then Elliot Wells/Jake Todd who were OCS. In the 2nd race – Elliot and Jake won from Anna Prescott/ Jess Eales with Daan and Roos 3rd. On the Sunday – Race committee decided not to go out sailing due to the windy conditions. The squad decided to go for it and had a brilliant sail in 20 knots with great waves, with the last 3 boats standing after a 3 hour session being – Phoebe+Tabs, Lauren+Esther and Max+Guy. Overall 3 boats tied on 5 points – Jenny+Jamie won with their first place in the first race and Anna+Jess took second from the Dutch boat because of their last race! The Dutch in the Feva class were very friendly and invited us to an evening getting to know them at their club. 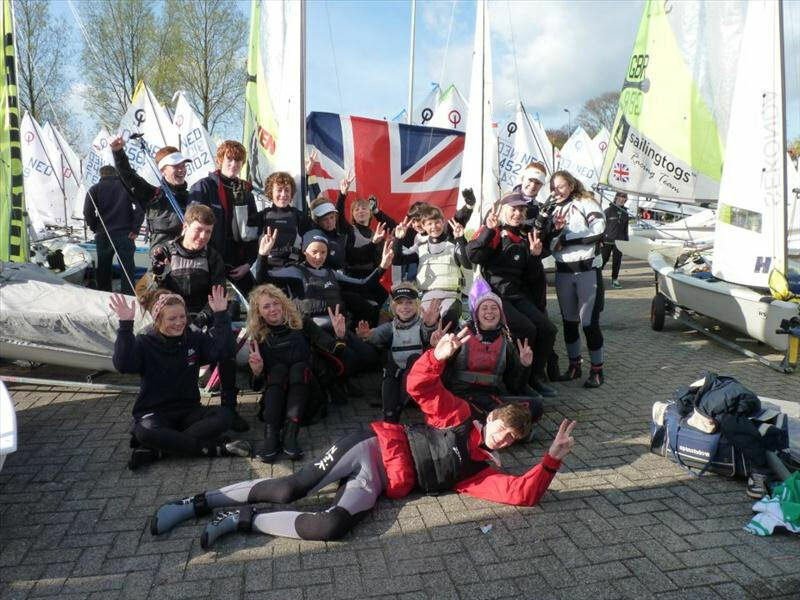 The Dutch and British squads all laughing together looking forward to seeing one another again at the worlds at Hayling Island this summer. A great trip and well worth the drive.